Only the evaluation of recorded and networked data enables targeted optimization measures of technical and organizational processes. One form of evaluation is the calculation of standardized key figures relevant to business management or key figures according to customer requirements. A frequently used functionality is the statistical analysis of malfunctions and downtimes that have occurred during production. Both the frequency and the duration of the malfunctions are broken down according to the various reasons for the malfunction and illuminated in corresponding diagrams. In general, [LuQ2] has filter options according to certain properties, such as the time of the event. This allows you to quickly and easily find the information you are looking for in the views. 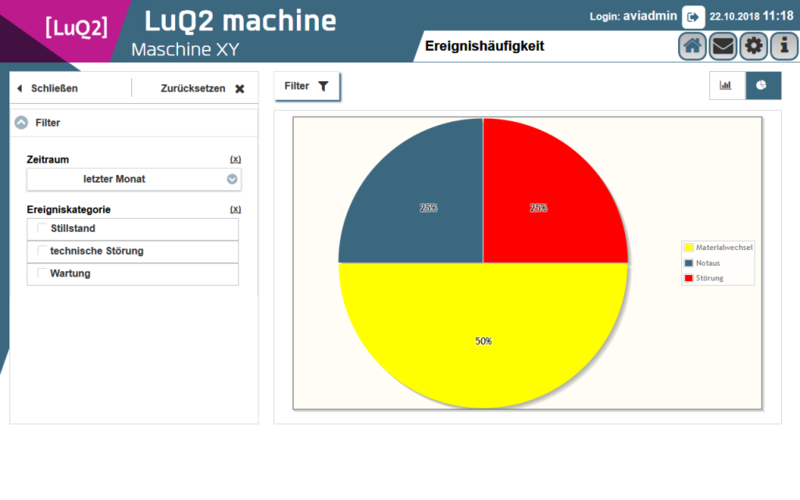 In addition, [LuQ2] enables individual evaluations with external tools, since the data is stored in a freely accessible and fully documented customer database.